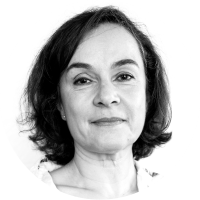 Luísa Roubad is a Researcher at the Institute of Ethnomusicology – Study Centre in Music and Dance and Professor in Dance Studies at the Faculty of Human Movement (University of Lisbon). Luísa holds a PhD in Dance, an MA in Portuguese Culture and Literature and in Psychology. In the past, she trained as dancer and worked as an actress. Her areas of interest are psychology and performing arts, and post-colonial and cultural studies in dance in the Lusophone context, topics in which she is the author of several essays and other writings. Luísa is a dance critic in the Portuguese press.